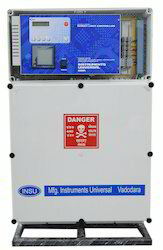 Instruments Universal is manufacturing Street light Automation products since 2000. We have developed products starting from normal timers, Astronomical Timers to ultra modern GPRS / GSM Street Light Management systems and individual Lamp Monitoring systems. We don't import products from china and label our name, development to manufacturing is done in India only. Wire less GSM/GPRS systems With CityLight software for constant monitoring, controlling and logging of switching on time, RTC data, electricity parameters and faults. Low annual operating cost type GSM base are among the most inexpensive wireless technologies available. And Low initial costs of installation As GSM wireless, there is no need to establish cable connection and is easily expandable to new areas and cities. Also it required no government licensing. Fast detection of errors by feeder pillar and along with GSM communication the street lights are always online any fault in street lighting electrical circuits is known to the operator within sort time. Simultaneously User settable Mobil no of supervisor and technician for instantaneous fault reporting. Unit self generate data massage like, ON time, Off Time, Power Down time, Auto mode, Manual Mode, Volt Fault, Over Current Fault, Short Circuit Fault, Neutral Fault, RTC Fault, Memory Fault, Low Ampere Fault, Door Open, Relay Fault, Calibration Data, and acknowledge the massage received from master like E Stop, Test Mode, Live Status, E Profile, parameter update, All this massage contain All electrical parameter with real-time clock date and time. it send to CityLight software through GSM/GPRS systems. Above image is indicative only, original product may vary as per specification finalized. It is an Almanac timer which is used for switching electrical appliances like street lamps, garden lights, corridor lights, neon signs etc. according to sunrise and sunset time. User need to just enter longitude latitude and twilight time of the place and rest will be done by the timer for ever.This Almanac time switch has added advantage over daily dial or weekly timers.Timer provides one / three outputs to drive contractors of different ratings. It also has manual override facility for emergencies, checking and maintenance of street lights. Password protected to prevent unauthorized access. We feel proud to introduce ourselves as one of the well-known manufacturers and exporters of Energy Saving Street Light Control Panel. 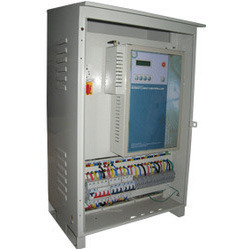 The offered energy saving street light control panel is highly liked by the clients, owing to the versatile messaging system and complete control on the street lighting system. 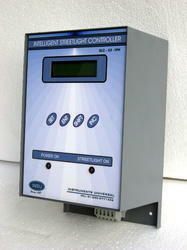 Our exported energy saving street light control panel is easily available at very reasonable market price. Saves energy with optimum lighting service. Raged design for longer life. Outdoor fitting ready to use. Operation adjustable on particular lux level. Unique ambient light sensing technology for soother operations. Lighting only when required technology will reduce expenses and carbon footprint. Photo sensor turn on and off light by automatically according to ambient-light. Sensor is such designed that Ambient-temperature and humidity can’t affect it. Smart fixture IUSF-01 is specially developed for individual user who wants affordable and reliable automation for compound lighting. It can also be used in parking lights, building stare case lights, Street lighting in Nagar palikas where very few numbers of lights operated and maintained by panchayats. IUSF-01 is esthetically attractive still affordable and reliable fixture to reduce manual errors, unauthorized operation with energy saving and optimum services. Smart fixture IUSF-02 isspecially developed for individual user who wants affordable and reliable automation for compound lighting. It can also be used in parking lights, building stare case lights, Street lighting in Nagar palikas where very few numbers of lights operated and maintained by panchayats. IUSF-02 is esthetically attractive still affordable and reliable fixture to reduce manual errors, unauthorized operation with energy saving and optimum services. Parameter data protection : With special device which hold the data for more then 10 years without any power and Password protected. Display : 16 character and two lines LCD display with backlight. Power Output : 11 KVA to 70 KVA as per requirment. Installation : Outdoor type. Floor Mounted.